My kids just devoured this like it was a huge plate of their favorite Mac and cheese. This was totally a what do I do with this Zucchini before it goes bad impromptu recipe and it just became a staple for so many future meals that I’m going to make. These Roasted Garlic Parmesan Zoodles can pair with a multitude of dishes and is insanely easy, quick and scrumptious. I could just imagine serving this later in the week with a nice grilled piece of salmon or maybe some delicious marinated chicken, the possibilities are endless. 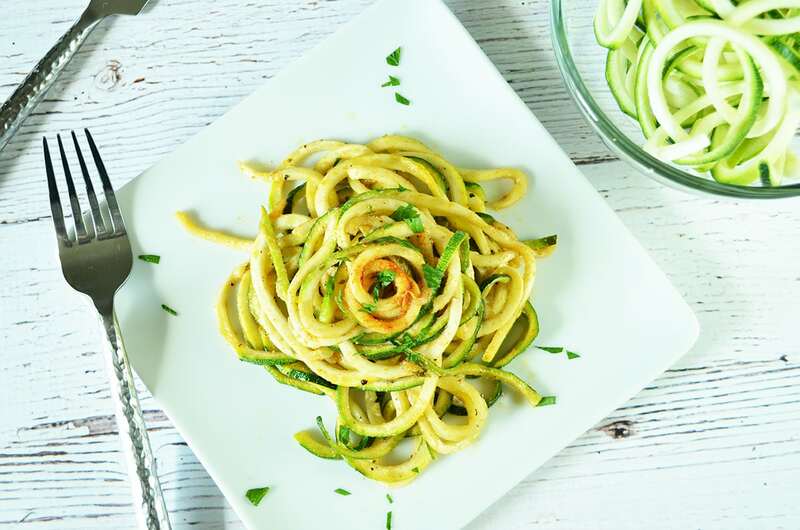 Some may be new to this whole spiralizer thing or you may not have joined this exciting craze yet, but it’s never to late. Fair warning, you may become obsessed with this awesome gadget while you’re trying all the new recipes like this Zoodle one. I loved loved loved these Roasted Garlic Parmesan Zoodles for a healthy and flavor packed meal. I’m on the hunt for healthier new dishes that leave me feeling satisfied and these savory Zoodles do just that. Try Roasted Garlic Parmesan Zoodles as a main dish or side dish that the entire family will love!